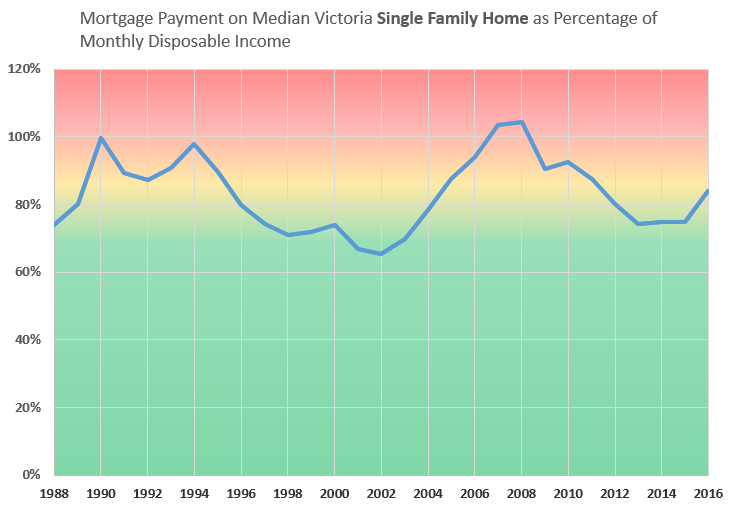 I did all of this work on affordability taking into account interest rates and incomes in victoria. No need to guess with national house prices. That is Oct 2016 data so a bit out of date, but you get the idea. Edited by LeoVictoria, 08 February 2017 - 09:53 AM. As a twenty-something interesting in buying my first home, I had to stop lurking and sign up to chime in. With the new mortgage rules, any of us looking to buy with less than 20% down are subjected to a stress test against the Bank of Canada's posted rate (around 4.5%, I believe). 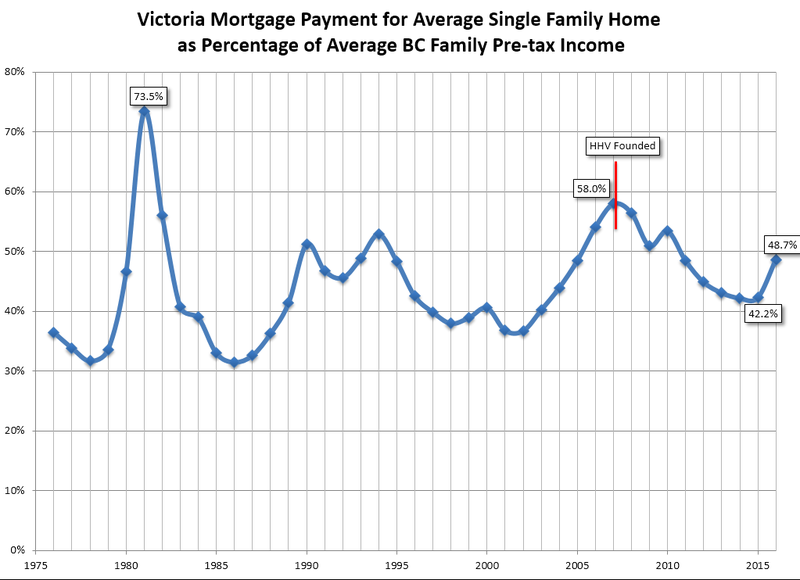 Assuming my partner and I were making the average family income in Victoria, we still wouldn't be able to buy a home in the price range of a single family house. If a mortgage at the actual rates I could get were going to consume nearly half my income, a mortgage at the Bank of Canada's rate is way over what lenders would approve for me. That's not taking into account that my partner and I are not making the average family income. I have a great job, but for various reasons my partner's income is significantly lower. For dual income earners, a single family home is unaffordable. For single income earners and those of us somewhere in between, even most two bedroom condos are unaffordable. I'm not that much worse off financially than my parents were at my age, so why did I get to grow up in a four bedroom house, when my future kids are going to be sharing our condo's only bedroom while my partner and I sleep in a murphy bed in the living room? Okay, rant (and coffee break) over. My basic point is that even $500/sq foot is absurd for any young person hoping to have a family. Well, the answer is market forces here. Most other parts of the country you'd be OK.
Yup, welcome to the club. And lots of folks believed in all of the bubble nonsense that was so popular between 2003-2010. Thousands of would-be home owners thought anyone buying a house in Victoria for $550,000 was out of their mind. If you're looking for a single-family-dwelling, consider the Cowichan Valley or subdivisions in Sooke. Other than that you're going to be up against stiff competition, very limited inventory and quickly rising prices. I'm not that much worse off financially than my parents were at my age, so why did I get to grow up in a four bedroom house, when my future kids are going to be sharing our condo's only bedroom while my partner and I sleep in a murphy bed in the living room? I grew up in Croatia in a communist style building in a one bedroom condo. I went outside and played in the parks with my friends, it was fun and I have a lot of great memories. Often I feel that my childhood would have been so much lamer if I grew up in Gordon Head in one of the 1970s boxes with a big yard. My parents moved to Canada in the mid 1990s when I was approx 10 yrs old and after a few years bought a bungalow in the Oakland's area. 801 sq/ft up and 801 sq/ft down. The down was immediately rented out as they didn't have a ton of money and 22 years later is still rented out. I lived with them upstairs in 801 sq/ft from 10 to 25 yrs old sans two years I spent away at university. Worked out perfect for them as now they don't have to downsize. They will probably end up being in the house for a total of 40-50 yrs depending on health. You don't need a four bedroom house to be happy and have a family. This condo sold the other day for $363,000 -> http://newportrealty.com/listing/1bk6 but how could one possibly live without insuite laundry? Our expectations in North America are off the wall in my opinion. Christmas shopping is a perfect example of how things are messed up. People stress out over the stupidest stuff. How about just spending good quality time with your family and skipping the idiotic mall crowds? Instead of a huge house with a media room to watch Netflix just go out to the park. Edited by MarkoJ, 08 February 2017 - 12:48 PM. Things have certainly changed one question for you was your parents four bedroom house their first purchase or did they work up to that ? Did they scrimp and save to afford it ,how was their income ? Was it in an ideal location or was it more affordable than prime location, how long did they save for it ? This example might be a little before your time . Other things have changed too take a funnel look out the small end that's what people used to spend their money on utilities,land lines ,small basic cable bills entertaining at home saving for things you want less credit debt, less stuff period. Now turn the funnel around it and look at everything people feel they need to be happy. Add skyrocketing utilities Internet fees ,how many cel phones in one family ,everything is magnified add to that high rents, make hard to save for a down payment. More stuff ,more credit . If you really want to buy start thinking how to achieve it . Think of ways to cut your spending and up your income . Extra work, less bills , foreign exchange students if you have the room ,buying a house with a suite live in the suite yourself pay down the principal for a short period of time . A sound house that needs lots of updates. A location with a commute to work . It all depends on what is an expectable trade off to you to own a home . It doesn't have to be your forever home it gets you in the market. I've walked in your shoes right down to not qualifying. It's hard I know . Ask questions figure out how to achieve your goals . In the end you have to question whether you want to put in extra effort to own . It might be harder for you to wrap your head around this coming from a place of a four bedroom house . To clarify, the price range of homes I've been told I can afford by mortgage brokers is <240k. And certainly in that price range there are some two-bedrooms in Esquimalt or Burnside that need upgrading, or some one bedrooms or studios in other locations that are in great shape. It has been years since I had any notion that I would be able to afford a single family home with a yard. But I had convinced myself that I could get a two or three bedroom condo within a 15 minute bike or bus commute to my job that wasn't formerly a meth lab. I'm having to re-evaluate that, and it's tough. It's a first-world problem and I should consider myself incredibly fortunate to have what I have, but it is still tough. What's alarming to me is that I can just barely find something that I can work with, and as far as I know, I am better off financially than many of my friends in the same age group. I have a good, stable job, no debts, no children to take care of, and a reasonable amount saved up. If that's what it takes to afford an entry-level condo, how will someone with student loans, or a single parent, or a low income earner afford anything? And who can afford a single family home in Victoria? I keep seeing houses up for $500k to one million, and I just don't understand who buys them. Here's the thing: Affordability of condos is not that bad right now at current low interest rates. However, the qualifying rate change from last fall has made it very difficult to get into the market. Edited by LeoVictoria, 08 February 2017 - 01:44 PM. And who can afford a single family home in Victoria? I keep seeing houses up for $500k to one million, and I just don't understand who buys them. Mostly working professional couples (like $150k+ family income) and than you throw in baby boomer parent down payment help. It's not fair but such is life; some people are 6'4'' and some people are 4'11''. That's a bit harsh. It's easy to have both. Ok so you have options great you qualify for something. Right now the prices are up so I've been told because of low supply,high demand. Many people can not afford a detached home in the area you're looking at . The house we bought in the day was the cheapest house listed in Victoria. And was listed unsold for sometime. School districts pay 850. Per month per student up to times x2 . I really do understand it's tough . You may not be able to afford in the area you want without lots of creative thinking. My ideas might not work for you . I'm aware of several 50 year olds and over own in town ,supplement their incomes in unconventional ways (other than rentals suites). It's a fact of life . Brain Storm see what's right for you . It sounds like sebberry lives in the building from hell…it’s hard to take anything he says about condo living at face value! My parents have a nice big house in the outskirts of a major city. My dad’s commute to his office takes 60-90 minutes, one way! Ninety! That’s like living in Nanaimo and working in Victoria. You can do that here, if you want. Trust me, many people do. Thing is, there are huge costs to commuting. Depending on how much you value your time, we could easily spend $10,000 per year on your commute. Victorians also seem to have absurd expectations of what they “should have”. People my age (late 20’s, early 30’s) seem to feel entitled to have a 2,500 square foot home within a 15 minute walk or bike ride to work. That’s not very reasonable to me. To think that you’re 25 and you should have a house in a very desirable market is silly. You’re not going to achieve that in many places that aren’t small towns. Most of single-family house North America has 2.5 cars per house and the husband and wife commute 2-4 hours per day combined. Victorians want the big house, no commute, free parking and zero GHG emissions. A very close friend of mine has done extremely well locally with creative housing investments. He first bought half a duplex and suited out the downstairs. Him and his then girlfriend lived in the suite, they saved up a bunch of cash and they bought the other half of the duplex. The whole place was converted into four suites and they were basically able to live there cash neutral. They saved up again, and bought a big old mansion that was converted into 6 or 7 one bedroom suites. They now live in one of the mansion’s modest suites with a dog and child. They own both properties. They’re not making a ton of cash – they’re effectively paying market value rent when you factor in all the upkeep – but they are in the market and building equity every month. One mistake I would advise younger people against is waiting. I’m kicking myself for waiting an extra five or six years to buy. Edited by jonny, 08 February 2017 - 02:33 PM. Depends. We waited about 5 years from when we could have bought and it worked out very well. Instead of buying a condo and losing money on it we went straight from a little 1BR 60s rental apartment to a house where we can stay forever if we want to. But those were the days when you could still get a house for a paltry half million dollars in the core. Market is totally different now. Waiting is not likely to be in your interest. Waiting for us meant having 20% down instead of 10%, but we also missed significant 2br/2ba condo appreciation. The Janion is one missed opportunity I'm really kicking myself for. Oh well. Victorians also seem to have absurd expectations of what they “should have”. People my age (late 20’s, early 30’s) seem to feel entitled to have a 2,500 square foot home within a 15 minute walk or bike ride to work. That’s not very reasonable to me. And it is not just Victorians. Watch some of those shows on HGTV where people are house hunting, they have $150k to spend and insist on granite countertops and luxurious bathrooms. One I just watched had a single lady, whose mom was putting up the cash, decided against a pretty luxurious condo because the toilet wasn't separate from the rest of the bathroom. You're the only one in the place lady, why does that matter? Sheesh.